Thank you, all, for such an overwhelming response to my last blog post. I know it was a hard one to read, but I also know that God is using the intimate parts of our story. You encourage us with your response and your prayers. 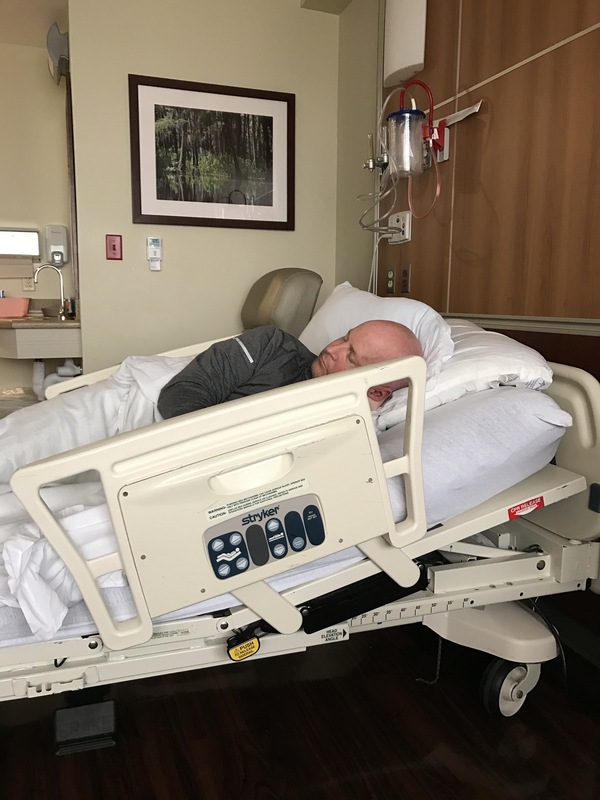 Today, I’ll keep it pretty light and just give you an update on how things have been going and tell you about our trip to MD Anderson this week. We changed our insurance policy for 2017, so that we could begin visiting MD Anderson on a more regular basis. This was our first time to go back since May 26. It was so good to see Dr. Weinberg, Clay’s Neurosurgeon. I’ve written a lot about him and how much we absolutely love him, so you already know how we feel about him. But, when he opened the door and I saw his face, again, it was like a reunion with an old friend. We’ve been so thankful that God led us right to him. I missed a good opportunity to take some pics for you, but we were asking too many questions and I didn’t think to do it. He compared the MRI image from the day after surgery to the most recent MRI. I love how he shows us on the computer and explains the images in detail. He is very thorough and concerned for us. He complimented Clay and reinforced how blessed we are that Clay is doing so well. He reassured us that the radiation treatment was very successful and shared how pleased he has been at every MRI. The tumor continues to shrink, and for that we are very thankful. He reads the blog! We were both a little surprised because we know how busy he is, but he knew about the seizure, the removal of the bathroom door, the change in insurance, and he even knew about the Krispy Kreme donuts! Ha! Clay used to say that he didn’t really care about bedside manner from a doctor. He would say that he just wanted the very best doctor, no matter how he was treated. Well, he has changed his opinion. I can assure you, that bedside manner is very important when you are in such a critical situation. Dr. Weinberg is the perfect combination of skill and concern. We truly feel like he cares about us, and it makes a huge difference. The Oncologist that we saw initially, Dr. Weathers, is on maternity leave, so Dr. Weinberg introduced us to Dr. Loghin. She talked to us about Clay’s medicines and just reviewed the past few months with us. We felt very comfortable with her and we have officially established her and her team as the primary Oncologist for Clay’s care. We will continue to have infusions with Dr. McCanless in Baton Rouge, and we will still see Dr. McCanless regularly. But, we will begin having Clay’s 8 week check ups at MDA. They will do an MRI and then we will meet with Dr. Loghin, or Dr. Weathers, to review it. MDA will now monitor all of his meds and make decisions regarding next steps. There are some clinical trials going on at the hospital, so we will have access to more information this way. We go back on March 19 and 20 for our next follow up and MRI. While we were in Houston, Clay and I enjoyed some time alone. A few months ago, one of Clay’s friends, Angie Robertson, sent us a gift card to the Pappa’s restaurants, which are all over Houston. So, we ate at my absolute favorite place, Pappasito’s! I love their homemade tortillas! Then, the next day, we ate at Pappadeaux on the remaining gift card. Thank you, Angie! You pretty much covered our food for the entire trip. We really appreciate it. In a way, we retraced our steps from previous trips, so Clay asked me a lot of questions about how things happened. We talked a lot about the first trip and his surgery. We remembered all the things many of you did for us. We talked about the visits many of you made to him. Sometimes the memories are difficult, and they can feel unreal, but the good parts make it all worth remembering. My parents stayed at the house with the kids. This is our FaceTime conversation. I love technology in these moments. I got to go to IKEA for the first time. Clay was not really excited, but he came with me. It was good exercise before the car ride home. I controlled myself and just looked. On the car ride home, we got into some bad weather. It rained pretty hard for about 20 minutes. But, as soon as the rain lifted, we saw a beautiful rainbow. The rainbow is one of the most miraculous things we see on a regular basis. We take them for granted, like the moon and the stars. But, God made the rainbow visible to our physical eyes so that we would always remember His promises when we see it. It is a spiritual experience when we see one. And, for me, this one was perfectly timed. It was worth driving through that patch of rain in order to see the rainbow reminding me that God is with us, and His promises are still true. Aw, man. My phone camera just couldn’t capture it. It was faint, but it was there. So, you’ll just have to believe me on this one. Before we left for Houston, we had some good days. Caleb worked a connection and brought Clay seafood from Montalbano’s! They aren’t reopened since the flood, but we’ve been craving their food, so Caleb hooked us up. I hope I don’t get in trouble for sharing this! (smile) They’ll be reopened soon. Kayla brought me a flower and a king cake. She is my precious friend from church and I love her like a daughter. Some of our newest friends, Suzy and Steve Maier, brought us dinner from Monjuni’s and a bunch of supplies from Melalueca. So sweet. And, Clay’s lifelong friends, Mary Lynn and Doy Henson brought us dinner and stayed for a visit. So, you know we’ve been going in for infusions for several months, now. I think we started them in September. And, you know that Clay is addicted to rocking chairs, right? Well, the chemo room is full of recliners, but all the chairs Clay has sat in have not been rockers, so we just assumed none of them rocked. When we arrived last week, the room was practically empty, so we had our pick of seats. I walked to an area we usually don’t go and found a rocking chair! Clay was so excited. I just thought this was funny. He’s a good sport. Clay started his chemo on Wednesday night. The side effects are getting harder, the longer he takes it. He’s been very tired and he got sick in the middle of the night Wednesday. That’s the first time he’s been sick from it. Today, the nausea is under control, but he’s very sleepy. All in all, we have very little to complain about. We are thankful for his strength and health during this time. His spirits are very good and we continue to enjoy each other and our family and all of you. Thank you for your prayers and love. We appreciate you so much. I don’t really know where to start. I’ve literally been staring at the screen for five minutes trying to decide where to begin this part of the story. And, for the last week, I’ve debated if I should share it with you, or not. It is, certainly, the most traumatic part of this entire experience for me. Clay doesn’t remember it, and for that I praise God. But, I will never forget it, no matter how hard I try. The Lord impressed on my heart yesterday that I should write about it. Sharing our struggles can be an encouragement to each other, and we’ve known from the beginning that God has a plan to use this story for His glory. Isn’t it amazing how God gives purpose to everything?! Even the most difficult troubles have at least one simple purpose in our lives – as God comforts us in our trouble, we are then able to comfort others who face a similar struggle. It helps us relate to each other. And, I’m sure that many of you who read this will relate. Seizures are actually pretty common, so I know I’m not alone in this. But, I felt very alone on Friday afternoon at 2:45. Clay and I had a business meeting Friday morning. A dear friend had been at the house for the meeting. Clay seemed mostly fine. He was a little out of sorts, but he handled the meeting with no trouble. When it was over, we went to get lunch. When we walked into the restaurant, it was freezing, and we both just felt like we didn’t want to be there. So, we ordered and asked the waitress to prepare the food in to-go boxes. We came home, went to our bedroom, turned the heat on (although it was warm outside) and sat down to eat and watch a movie. After he ate, Clay got up and told me he needed to go to the bathroom. I had dozed off to sleep, so he woke me when he got up. He walked into our bathroom, then into the toilet closet, closed the door, and collapsed. I heard a terribly loud sound, like the toilet seat had been slammed down as hard as possible, but I knew that wasn’t all it was. I sat straight up and yelled Clay’s name. He didn’t answer so I ran to the door. When he collapsed, he was facing the door, so his body fell down between the toilet and the wall, and his legs were straight out toward the door. Unfortunately, Clay picked the very smallest space in our entire house to have this episode. The area is probably 3×5, and the toilet takes up the majority of that space. His legs were blocking the door. But, worse, he was having convulsions, so his legs were constantly banging against the door. This is how I was absolutely sure he was having a seizure and not just unconscious. I am on the outside of the door, screaming his name, while pushing with every bit of my body weight against the door. The floor is wood and I had socks on so I started slipping. I would push against the door, slip and fall. My mind was going 100 miles an hour and I couldn’t even complete a thought. All I could say was, “OH, GOD. HELP ME!” That’s all that would come out. After probably a minute (which feels like an hour when you can’t get to your husband) I was able to push the door enough that my arm would fit through. I worked to move his left leg out of the way so I could open the door. I was literally afraid I was going to break his legs, but I had to. I had to get in there to him. I quickly assessed the room and his position. I knew I needed a phone to call 911. I made sure his head was in a secure position and that nothing was bleeding. Then I looked down and the phone was right there on the floor. I called 911. The operator dispatched EMS as soon as I gave her my address. I was breathing so hard into the phone that she was worried I was hyperventilating. She reminded me repeatedly to breath. I don’t know if I had ever felt like this before. I was crying and talking and praying and freaking out. My head was fuzzy, my thoughts were not clear, but I was in total control at the same time. I realized that we were upstairs and the door downstairs was locked. They wouldn’t be able to get to us. Oh no. All I could think was that I didn’t want Clay’s mom to see him like this. It was terrible. I was holding his head and (gently) slapping his face, crying his name….begging him to talk to me or open his eyes or respond somehow. His eyes were rolled back in his head, he was drooling and he just wasn’t there. It felt like he was leaving me. I couldn’t move him because he was stuck between the toilet and the wall. I was so worried that it was hurting him to be smashed in there. But, the other side of my brain was in complete and total panic. I was looking at him, and I was sure this was it. I was crying out to God saying, “Please, God. Please don’t let it happen like this. Please.” I couldn’t breath. Then, I hear the operator. “Ma’am. Is there anyone else I can call?” I asked her to call my dad. He lives about 8 minutes away, but I’m certain he walked into the bathroom within 3. The fireman had arrived and were very calm. They got Clay out of the bathroom. He moaned really loud when they pulled him out. When dad arrived, he was laying flat on his back on the floor and was totally unresponsive. But, they kept reminding me that he was breathing and his heart rate looked good. The EMS team got there and really helped me calm down. They tried to sit him up and he had another seizure, so they decided to sedate him. One of them said, “Geez! It is really hot in here!” I remembered we had actually turned on the heat because Clay was so cold. I told one of them to go turn the air on. We were all sweating bullets. I called Dr. Gummadi to tell him. He was very calm and encouraging on the phone and he told me he would call ahead to the ER to let them know we were coming. And, I knew that he would start praying. I asked Dad to text our pastor’s so they could put it on our prayer chain at church so people could be praying. We have such wonderful people in our lives. People who truly pray. I knew they would. Dad helped me contact the kids and make arrangements for Ben. I threw clothes in a bag and jumped in the ambulance with Clay. Several of our sweet neighbors had walked over to check on us and offer their help. Sam drove up as I was sitting in the ambulance with Clay. It did my heart so much good to see him. Sam is our oldest and he is a huge help to me. He really loves me and checks on me. He always knows when I just need a hug. I was so glad to see him. Then Grace arrived, but we were already pulling out. Dad drove Flo, Sam and Grace and followed us to the hospital. The Baton Rouge General has been so good to us. They were waiting on us, and immediately started taking care of Clay. Almost as soon as we got in the room, Caleb walked in. It shocked me a little. I couldn’t think fast enough to even know how he knew we were there. (The prayer chain.) He hugged me and I knew he had been constantly praying. I asked him to send Sam and Grace in because Grace hadn’t even seen Clay. I have really awesome kids, y’all. They are strong. Of course we cried together when they first came in, but I reminded them that, at this point, he was sedated. So, he wasn’t only sleeping because of the seizure, but the meds were keeping him asleep. It is really hard for them to see him like that. They wanted to know what happened, so I told them the story. As I was telling them, I started to realize how God was there, in every detail. I was alone when it happened. I wanted to be mad about that, but then I realized how glad I was that the kids didn’t see that. Any of it. I was so frustrated that it had to happen in the toilet closet. I mean, why couldn’t he have been in the bedroom with me? But I realized that the way he fell, caused him to be stuck in an upright position. He didn’t hit his head, and when he was having convulsions, he couldn’t hurt himself. He couldn’t aspirate. I couldn’t get to him. I was so upset about that. But, maybe God was protecting me from seeing the worst part of the seizure. I could hear him, but I couldn’t see it. His phone was right beside him so I could easily call 911. I just started thanking God, in my heart, that He never leaves us….even in the valley. They did an MRI almost immediately. This was the 5th MRI Clay has had at the BR General. Do y’all remember in an early blog, I talked about how the people at the MRI office remembered us and some of them had even read the blog? Well, we feel like we’ve gotten to know them because we’ve seen them so many times, now. So, when the nurse, Grace and I were coming around the corner with Clay on the hospital bed, Brian and Chris were waiting at the door for us. It might sound silly, but it just made me relax when I saw them. I just felt a comfort. His sedation wore off right in the middle of the MRI, and he started kind of freaking out. So, we had to stop it and let him out for a minute. He was so drugged that he really didn’t know what was going on. But, they sedated him, again, so we could finish. I stood by him and held his hand and just prayed while he was in there. Of course, I was scared that they would tell me the tumor had doubled in size and that’s why he had the seizure. Within an hour, the ER doctor came and told us that the MRI showed that the tumor is actually smaller than it was at the last MRI, just about 5 weeks ago. Praise God! It continues to shrink. Clay’s parents and Sam and Grace were in the room with us and they told me how many people were in the waiting room. I couldn’t stop crying as I was hugging all of them and thanking them for coming. And, this is not everyone. At least 10 other people came and went throughout the night. Y’all, I just can’t really tell you how much this means to us. God has taught me so much about how we, the church, are called to be the hands and feet of Jesus. This means that we are a physical representation to each other of what Jesus is to us spiritually. The love that I felt when I opened the door and saw all these faces can’t really be described. And, that’s how it feels to know that Jesus loves us the way He does. Thank you. Thank you for being a continual reminder to us that Jesus loves us and He is here. They did a CT Scan of Clay’s ribs, which was totally fine, and by 9:30 pm, we were in a hospital room. Caleb brought Clay Krispie Kreme donuts. It was pretty funny. He said, “I figured that all the problems started when he gave up the Krispie Kreme, so I think he needs to start eating them again!” Ha. We got a good laugh. Clay slept all night. The nurse would come in to check and see if he was able to talk to her for a minute, but he just wouldn’t wake up. They took blood twice and he hardly moved. I laid beside him in the bed and my mind just raced for a long time. I was pretty exhausted, too, but I couldn’t sleep. Moments of crisis have a way of revealing the deepest parts of a person’s heart. Your greatest fears rise up to the top and you are able to see things about yourself that you didn’t see before. 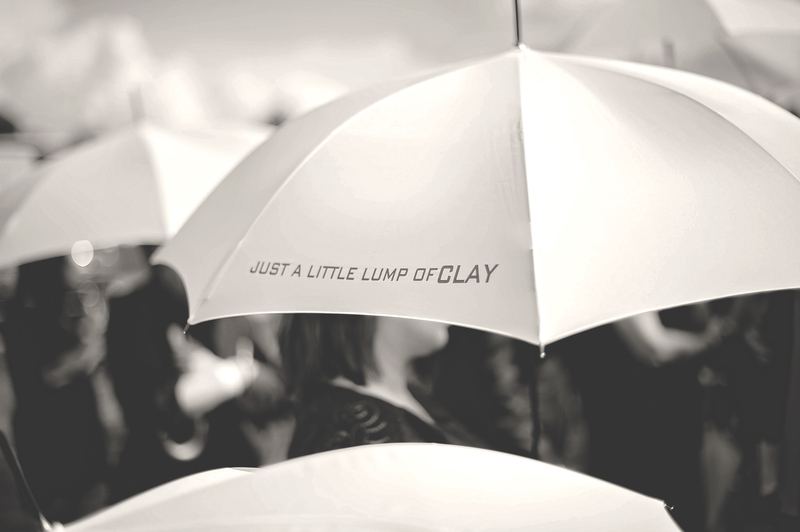 I realized that I have already imagined, in my mind, how things will look if the Lord takes Clay. And, I think I had decided that I will accept the Lord’s will, as long as it happens the way I think I can best deal with it. Well, I didn’t deal with this situation very well, at all. I saw a great deal of weakness in me. I saw my dependance on Clay. I saw my fears. I saw my sin. I felt what it would feel like to lose him. I felt fear. I felt panic. But, I also saw my God. And, I felt my God. He showed Himself to me in a new way. For 10 minutes, He was literally my only companion. He was my only source of strength. He was my only help. There was no one but Him. And, He was there. Comforting. Speaking. Helping. Loving. Gently reminding me that He was at work in every detail. If you are reading our blog, and enjoying the story, but you read the words and you can honestly say that you don’t know God like this…. I beg you. Ask Him to reveal Himself to you. Ask Him to be your Savior. Ask Him to show you who He is. Because when you are in your greatest moment of need, you don’t want to be praying to a God you don’t know. You want to be praying to a God that you already love. You want to know Him. You want to have that confident assurance that He hears you and that He is with you. And, if you ask Him, He will. He wants to walk closely with you. He wants to help you. We were in the hospital all day Saturday. Dad drove us home on Saturday afternoon. The Neurologist gave us a prescription for Keppra, a seizure prevention medicine, and sent us home. You will probably be surprised to know that Clay is only on 2 daily meds. He takes a steroid and, now, Keppra. I asked my Dad to go check on the toilet upstairs. I knew it had broken, so he went to check on it. He temporarily patched it so the seat would stay on, but he asked if I wanted him to take the bathroom door off. I said no, and told myself that I could totally handle this and I didn’t need to do anything that extreme. Clay and I went upstairs to shower and he walked straight into the toilet closet and closed the door. Now, keep in mind, he didn’t remember anything about the seizure, so he had no idea why I would be bothered. But I immediately started asking him to open the door. He barely knocked the toilet seat with his leg and it fell off and crashed to the floor making a loud sound. I lost it. I was crying and begging him to open the door. He finally did and when he saw my face, I think he must have thought I was crazy. I finally got him in the bed, and immediately called my father-in-law. I said, “I need a favor.” And I just started crying. Now, you have to know how much my father-in-law loves me. He is so wonderful to me and he would do anything in the world I ever asked him to do. He was at the house within 30 minutes with the tools needed to take that door down. He and Sam just took it off the hinges for me. It could, quite possibly, be a very long time before we put it back on. When I woke up Sunday morning, I noticed a huge bruise on my knee and my body ached from my head to my toes. I was sore everywhere. The bruise was from falling when I was trying to get in the bathroom door. The aches were from trying so hard to move him, and then I guess just the stress that occurred. I was weepy and sad. I felt like I had PTSD. When Clay woke up, he couldn’t remember anything from Friday or Saturday. So, I sat with my coffee cup, staring out the window, and told him the whole story. It was like therapy, but it was hard. When I was finished, he looked at me with the sweetest eyes, and said, “I’m so sorry I put you through that.” Isn’t that sweet? That’s how he is. Then we watched our church service from home, and it was exactly what we needed. Our pastor spoke directly to my heart and I was so encouraged. Today marks a week since it all happened, and we are both much better. Clay is getting stronger each day. God continues to speak to us and help us. He really had to reach down and pull me out of a pit, but He did. I hope that, as you read this, you are encouraged to know that God is always present. We live in a hard world and life is very difficult. But, that difficulty gives God such an opportunity to prove Himself to us. He is real. He is present. He is loving. He will be your strength when you need it. He will be your comfort when you are lonely. He will be your joy when you are in the pit of despair. He will be your protector when you are afraid. He will be your friend when you need to feel loved. I pray that you will let Him be all that He can be in your life today. I love you more than you could ever know. I don’t even know some of you, but the Lord encourages me so much every time I see how many of you are reading our story. It gives us a feeling of great purpose. Thank you. Clay is finally awake and responsive this morning. He slept really deep all night. He was only awake and talking for a few minutes all evening. He had to be sedated twice, so he had a lot of medicine in his system and everyone reassured me that it was normal for him to be disoriented and sleepy. But, he woke up around 8:00 am and has been talking to me this morning. The hospital doctor came in at 7:45. I was so happy to see her familiar face from our first visit here at the BR General. She is sending a Neurologist to see us today and then we’ll get to go home later this afternoon. They feel confident that the seizures can be controlled with medication. Please pray that is true. I don’t want to do this again. Thank you, again, for your prayers. Thank you for the calls, texts, Facebook posts and visits. We feel so loved by all of you. You really are the hands and feet of Jesus to our family right now. Clay had a seizure today. A pretty bad one. We are at the hospital and will stay here for the night. I’m sending this update because I know many of you are praying and wondering. We had been at the ER for less than an hour and there was a whole group of people waiting for me in the waiting room when I came out. I couldn’t stop crying…not only because of Clay but because we feel so loved in these moments. He is a special man. Thank you for loving him. They have already completed an MRI and we are doing a CT Scan right now. The MRI showed that the tumor is actually smaller than it was at the last MRI. So it continues to shrink. Seizures are not uncommon when you’ve had brain surgery, but they will continue to study him to find the cause. We’re being admitted and will stay here until they tell us next steps. They are doing a CT Scan of his ribs because Inwas concerned they may be hurt from his fall. Please pray. Pray for strength. Pray for healing. Pray for God’s peace, which we already have. Pray for my kids. God is so good. He is at work. For now, things are much more calm. Thank you for your prayers. I’ll update you soon. A village was being pillaged and persecuted by a group of terrorists. There was a Christian family who would not deny their faith. The terrorists forced the family to dig a trench. Once they completed the digging they told the entire family to get in the trench. If they did not deny their faith, they would be buried alive in the grave they dug themselves. After the son began to sing, the daughter joined in. As the dirt continued to rise over their heads, the whole family just sang to Jesus….their Savior who they were about to see face to face. Everyone who was there watched as this entire family faced death, together, and in total unity. The world watched as Jesus comforted them in their greatest time of need and they entered heaven together as a family…rejoicing in their salvation. One of the terrorists who helped bury the family was haunted by the song they sung. For years he could not escape the sound of those children singing with their parents, and the thought of them facing death with such peace. He played it over and over in his mind, until one day, he walked into a church and gave his life to Jesus. The death of this family resulted in life for this man, and probably many others. As I listened to this story, all I could see was my family. I could literally see us. Standing there in the trench. Nasty, ugly, mean terrorists all around us yelling at us and throwing dirt on us. I could see how Clay and I were strong. We are grown ups. We are ready. We are mature in our faith. We are able to see that God is made strong in our suffering and that He is using this trial to bring people to Himself. And, we are spiritually mature enough to surrender to His will. What father or mother wouldn’t do this? I have stood before the Lord many times since May 2 and pleaded for my children. I have yelled at the devil and all his stupid demons and reminded them that they can NOT have my children. They might cover our heads up with dirt, and take the breath from our bodies, but they will NOT take our souls from Jesus. I have this overwhelming desire to see someone come and pull my kids out of the pit and take them to safety. I’ll gladly stay here with Clay, but please let my children go. Let them live. Let them never face trials and trenches. Let them have joy and happiness. Let them have abundant blessings. But, I can’t make that happen. I can’t protect them from some things. I can’t promise them a life with no trench. I can’t take away the pain they feel or the hurt they may still face. The only thing I can do is teach them the song. They have to know that song. The song is what will get them through. The song is what will give them the resolve to stand at peace while their head is covered with dirt. You know….the song in their heart that reminds them that Jesus loves them. That He is a Savior. That He is a healer. That He has built us a home in heaven that is waiting for us. The song in their heart that tells them that He is a good Father. He is a loving God that makes all things work together for good. A song that proves He gives peace that passes all understanding. A song that causes their heart to praise God, no matter the circumstance. You see, God GIVES the song. I can teach them the words, the principals, the truths, the scriptures, but God has to give them the song. He is the one who writes it on their heart. He is the one who puts it in their spirit. He is the one who proves it to them and gives them life through the song. And, y’all, let’s be honest. How many people, especially children, learn deep truths and important lessons just from hearing about other peoples’ experiences? Not very many. We learn by experience. We learn through difficulty and hardship. Look back at the scripture. God didn’t give David the song, until after He lifted him out of the pit. Going into the pit, gives God a chance to teach us more about Him, and then He gives us a song. So, I had to realize that, while I want to rescue my kids from this trench….this trench is where God is proving Himself to them. He loves them more than I do. He knows the deepest parts of their hearts. He is here in the trench with us and He is going to hold them up, just like He is holding me up. And, just think back to the story. In the moment where the father was pleading for the childrens’ lives, the mother was probably bawling and begging, too. Imagine the look on their faces and the feeling in their hearts when the son started singing. And, then the daughter joins in. Could anything in this life make you more proud? How would it make you feel to see them face death with you and lead your family in a song of praise to the Lord?! I bet those parents’ faces were beaming as they joined in on the song. Yesterday was Clay’s birthday. He told me at least 5 times last night that he had a really good day. It was very simple, but we had a lot of good quality time. We spent the morning together and then had lunch by ourselves. Then our parents came for dinner and cookie cake. We even had a visit from Daniel Wesley, who is a sort of local celebrity right now, and a good friend of Sam’s. After all the celebrating, we sat down with the kids, and I shared a lot of what is written here. Clay and I both told them how we feel and what we desire for them. Clay really shared some powerful words that can only come from him…or from a person in his situation….about the peace of God and the importance of knowing Jesus before you face death. He told them how much he wants to be sure they are in heaven with him so that we can have an assurance that we will all be together for eternity. We told them, through lots of tears, that we want so badly to rescue them, but we can’t. We reminded them that God didn’t make this tumor and put it in Clay’s head. That this is not punishment for sin. That God isn’t just playing with our emotions. We reminded them through scripture that our lives are solely meant to demonstrate the glory of God to the world. We explained how living with a heavenly perspective can completely change your view of your life and circumstances. This one is really hard for them to understand right now, but I think they are slowly getting it. Do you remember the song “Thank You” by Ray Boltz. It’s an oldie, but a really goodie. I used this to explain to the kids why God uses us in the lives of others. And, just imagine the feeling…one day when we get to heaven…we will know and see all the people who are there because of our testimony. What an amazing feeling to look up and see a line of people just waiting to tell you how you impacted their lives. People who are coming to tell you thank you for giving to the Lord. And, imagine the feeling of standing there, surrounded by people you’ve touched, and then seeing Jesus! Jesus is there and He also sees all the people who are there to tell you thank you. And, He gets all the glory, but you get to stand there with Him and see what He was able to accomplish through your life. If we can live each day, totally believing that this moment will truly come – we can change the world. I mean, can you imagine anything more wonderful? Can you imagine anything on this earth that would be more important than that moment? I can’t. This is how we live with a heavenly perspective. And, that heavenly perspective, along with a song in our hearts, is what will give us the resolve to stand in our trench and sing a song of praise to our God while we are surrounded by rising dirt. And the world will watch and the world will see that our God is greater. Our God is stronger. Our God is faithful. And many will be astounded and put their trust in the Lord. Amen! I saw a video on You Tube today depicting 2016 as a Horror Film. You probably saw it. It was a pretty funny idea. But, it made me think about how many people are so ready for this year to end. 2016 has been a hard year for most of us. In a quick response, I probably would have said that 2016 was a horror. But, as I sat and reflected this morning, I could clearly see that this is not, at all, how I feel. While it has, by far, been the hardest year of my life…..it has, in many ways, also been the best. Weird, huh? I know. I’ll tell you why…. But, first, let me tell you why I’ve been so reflective. I spent my day today cleaning out my office. 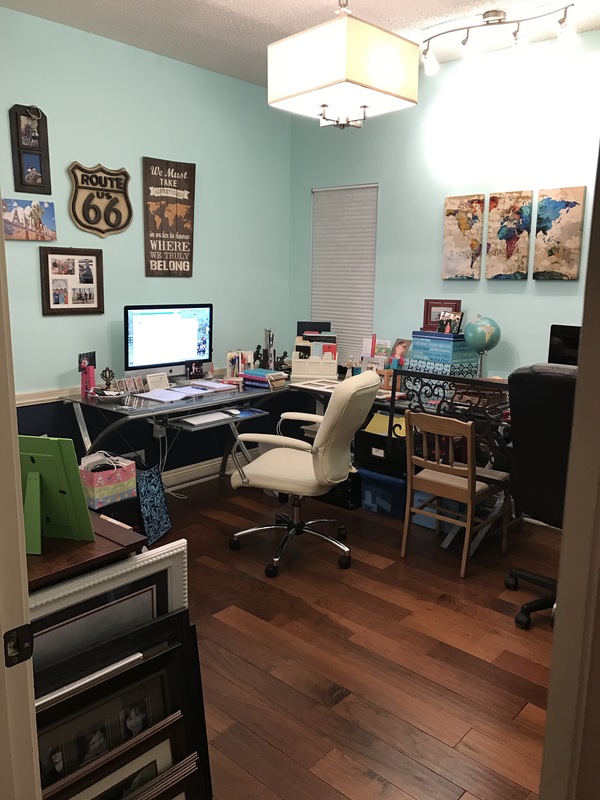 This is where I write, where I pay the bills, where I store all our family memories, where I keep all my unfinished projects. And, it was a disaster! As I started cleaning and organizing, I took a 2 day trip down memory lane. I found so many things that brought back sweet memories. 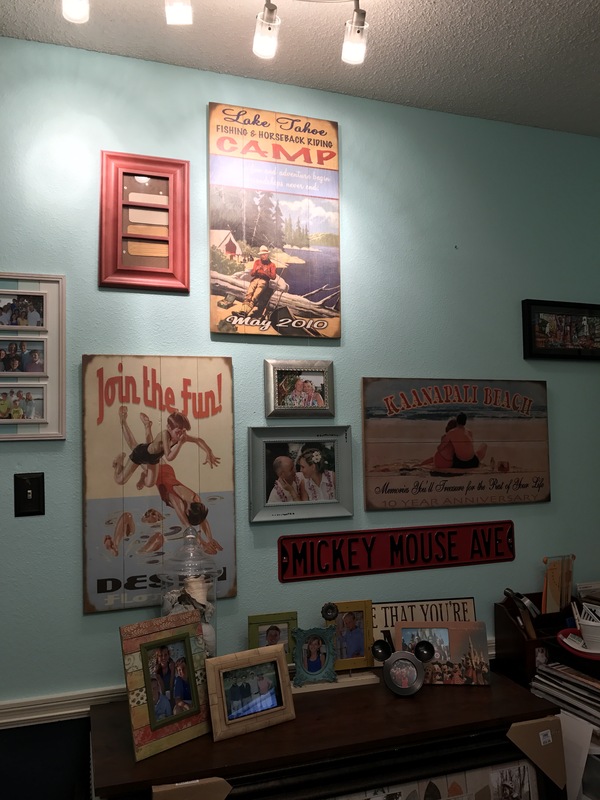 These are my unfinished “Adventure” walls that are covered in memories from our favorite vacations. These are two of my favorite pics from my work life at Capital One for 17 years. I miss these faces. And, look at that pile of pics that I need to organize! Yikes. That’s a bit overwhelming, so I just focused on getting them all in one place. Then, after two days of working and looking at old memories, I found this…. This bucket is filled with cards and letters from many of you. I sat in the middle of my office floor….very hard wood, by the way…..and read them all. I cried lots of tears as I relived the past 6 months. And, although it probably seemed like I was falling apart, I wasn’t. They were good tears. While there are some sad memories, that bring thoughts of difficult tomorrows, it was so sweet to recall how wonderful all of you are. We have been absolutely showered with love and affection. So many of you are praying constantly and have been since May 2. You have called, texted, sent letters, sent cards, sent us gifts, visited us, fed us, prayed for us, prayed with us…….you have truly been the hands and feet of Jesus. Hebrews 12: 1-13, “Therefore, since we are surrounded by so great a cloud of witnesses, let us also lay aside every weight, and sin which clings so closely, and let us run with endurance the race that is set before us, looking to Jesus, the founder and perfecter of our faith, who for the joy that was set before him endured the cross, despising the shame, and is seated at the right hand of the throne of God. Consider him who endured from sinners such hostility against himself, so that you may not grow weary or fainthearted. In your struggle against sin you have not yet resisted to the point of shedding your blood. And have you forgotten the exhortation that addresses you as sons? “My son, do not regard lightly the discipline of the Lord, nor be weary when reproved by him. For the Lord disciplines the one he loves, and chastises every son whom he receives.” It is for discipline that you have to endure. God is treating you as sons. For what son is there whom his father does not discipline? If you are left without discipline, in which all have participated, then you are illegitimate children and not sons. Besides this, we have had earthly fathers who disciplined us and we respected them. Shall we not much more be subject to the Father of spirits and live? For they disciplined us for a short time as it seemed best to them, but he disciplines us for our good, that we may share his holiness. For the moment all discipline seems painful rather than pleasant, but later it yields the peaceful fruit of righteousness to those who have been trained by it. So many have gone before us in this walk of faith. So many have endured so much more than we are asked to endure. Especially Jesus. When our life seems hard, and we start to grow weary, all we have to do is think of Him and what He endured for us. He did no wrong, yet He suffered….for me. For you. Nothing we will ever face in this life will compare to what He suffered. So, we must consider Him. And our spirits will be lifted. This passage talks about how God disciplines us because He loves us. When I hear the word “discipline,” I think of when my kids are in trouble and I have to punish them to correct them. But, as a parent, I also use life’s situations to teach my kids how they should behave. It’s the same with God. If you are going through a hard time right now, it may not be because you are being punished. Maybe God is using your circumstances to teach you and mold you. The good news is that He doesn’t leave us alone. He loves us too much to do that. He is constantly trying to teach us and make us more like Him. And, as He works on us, it yields righteousness and holiness….that can not be attained any other way. So, tonight, as 2016 comes to an end, I am not slamming the door and kicking this year to the curb. I am reflecting on all the work that God has done in me and thanking Him that, in the midst of pain and an unpleasant year, I can see how He is closer than ever. I rejoice in Him more. He has made Himself very real to me, and I wouldn’t trade that for anything. I think many of you feel the same way. It has been a hard year. But, look at all that God has done for us and in us. As 2017 arrives, Clay and I are looking forward. We changed our insurance plan so that we have more flexibility and I began the process of scheduling appointments at MD Anderson. The doctors in Baton Rouge have been so wonderful to us, and I know that we were meant to be here for treatment over the past several months. But, we’ve reached a place where I feel we will benefit from the expertise of the doctors at MDA, again. Clay continues to take the Avastin infusion every other week and the Temodar (chemo) once a month. Our last MRI was a good report that the tumor is shrinking, so things are moving in the right direction. He is not on the steroid any longer, and he has completely lost the cravings and his appetite. I haven’t weighed him, but I think he’s probably lost 10 pounds already. The “dad-bod” is in jeopardy!! He enjoyed the holidays and did great until Christmas day, when the chemo caught up with him. He stayed in bed most of that day and the few days following. He’s still dragging a little, but it gets better each day. His Aunt Sue (from Nashville), his dear friend Michael (from Beaumont), and his cousin Mike (from San Francisco) visited this week. I hear the fireworks beginning outside…even in the pouring down rain…. 2017 is here. What will it hold? I’m not sure, but as long as we have Jesus, we can face whatever it brings.